It is said that the dialect or languages spoken in India, changes with every 200 kilometres. So it should not be surprising that a festival like Dussehra has a variety of flavours across the nation. Being one of the most celebrated festivals in all parts of the country, Dussehra witnesses joyous celebrations everywhere. Popularly known as Dussehra, it takes different names across the country, such as Vijayadashami, Dasara or Durgotsav. According to mythology, while Dussehra marks the victory of Lord Rama over Ravana, Vijayadashami is looked as the victory of Goddess Durga over Mahishasura on the tenth day of Navratri. Broadly speaking, the celebrations differ greatly in South India and that too in multitude forms, from the rest of the country. The auspicious festival of Dussehra is celebrated with much devotion in various temples across the state by visiting the Ammavaaru temples or the temples of Goddesses which are beautifully decorated with flowers. 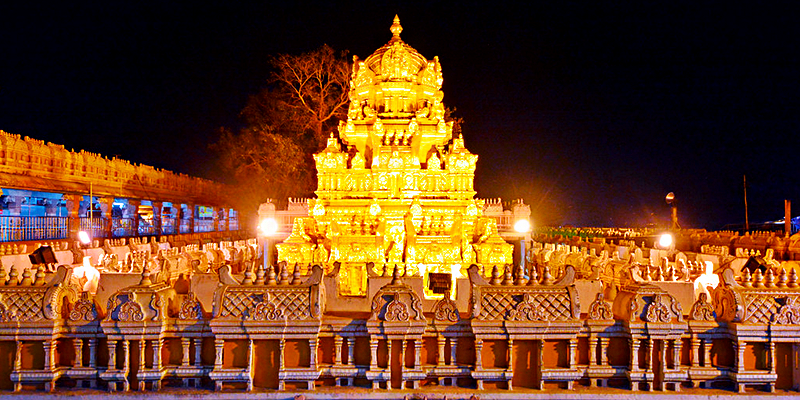 The main centres of attraction are the Lord Venkateswara temple at Tirumala and the temple of Kanaka Durga Ammavaaru at Vijayawada. Another important aspect of Dussehra in Andhra Pradesh is that people set up ‘Bommala Koluvu’ at their homes. This refers to a neat arrangement of dolls set up in a tasteful manner. The festival gets concluded by performing the immersion of idols of Goddess Durga. 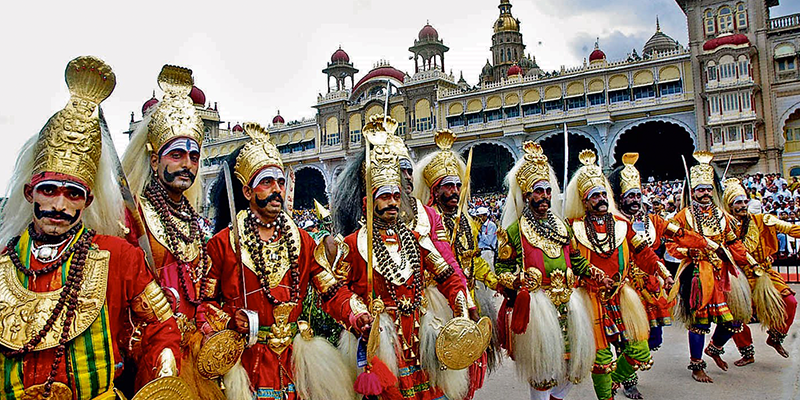 Dussehra or Dasara as it is known as in the southern part of India is synonymous with Mysore. It is the most extravagant festival which sees the entire city lighting up and coming alive. It is the most extravagant festival which sees the entire city lighting up and coming alive. And, it’s not just the spirit of the season; it is also the royal touch that the celebrations have. 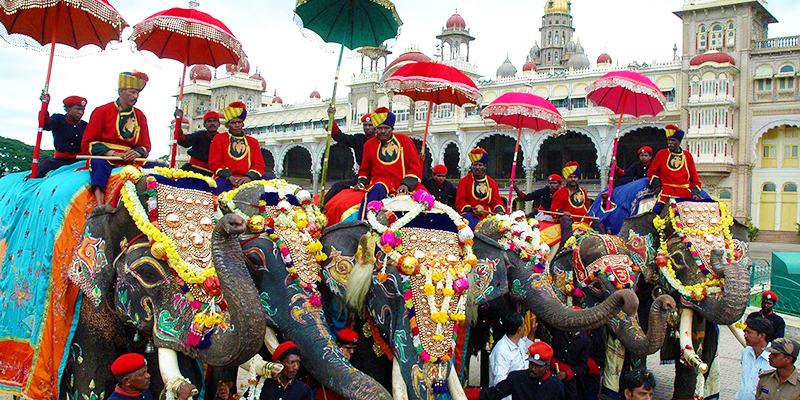 The festivities take place mainly at the Mysore Palace, which is the official residence of the royal family of Mysore – the Wodeyar family. When it is Dasara time, this otherwise peaceful city erupts into life and every corner is bustling with activity. As you walk through the city, you can see that the whole city is dressed with flowers, lights, stalls, music and the people. People flock the city every October to be part of the exquisite celebrations. 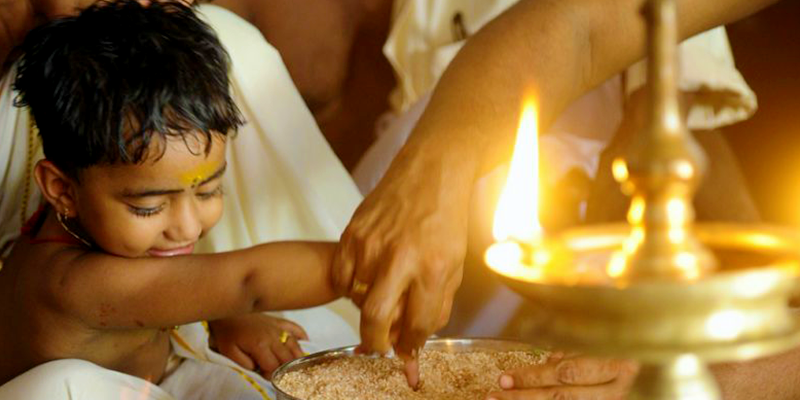 Right from performing Puja Veypu(offering books for worship), Puja Eduppu(taking back books after worship) to the Vidyarambham(Initiation of writing), this festival holds in a lot of faith and worship in Kerala. Ayudha Puja is also conducted with great fervour. The fascinating feature of a nation as large, as multi-lingual and as diverse as India is its cultural spectrum which reflects its values for festivals. Dussehra symbolizes the victory of good over evil and such diverse celebrations are a simple acknowledgement of goodness to overpower the evil and set us free. Nice pictures and great information. When train no or train name is mentioned, the details should come up,so that we can save time. Dussehra denotes the day of Victory of Good over Evil. Enhance your Dussehra 2016 celebration with various puja and products offered by Rudra centre. Dussehra denotes the day of Victory of Good over Evil.